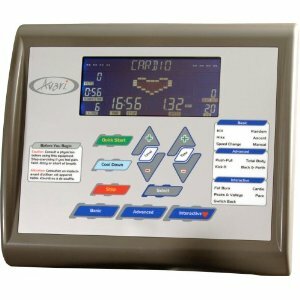 The Stamina Avari GX8 elliptical is a sturdy self-powered model. It has won high praise for ease of use, ergonomic feel, and construction. The large, easy-to-read console shows your workout time, time in target heart rate zone, resistance level, heart rate, calories burned, RPMs, distance, and speed. The push button control allows the user to adjust speed and resistance on the fly. UPDATE: The Avari GX8 has been discontinued and replaced with all new and improved models. The Stamina Avari GX8 elliptical features Stay Put foot pedals that offer 180-degree rotating toe/heel pieces to keep feet positioned correctly, and the Up-Link technology that allows you to work harder with your upper body or emphasizes your lower body. Other features include a 20" stride length, magnetic resistance, and a 300-lb user capacity. The electronic display panel looks like some kind of board game, but the layout is simple enough for a child to figure out. It has interactive Target Heart Rate zone training, and comes with telemetry strap as well as the hand sensors. Another big plus is the first rate user manual which has detailed information on how to fix squeaks, rocking movement, or any other troubleshooting issues. Stamina Fitness makes a variety of different products and their ellipticals can range from so-so to first rate. The Avari is one of their best products. The Avari GX8 elliptical has been rated by Consumer Reports magazine as one of the best quality, best-priced ellipticals in its class. It earned high scores in six areas tested: ergonomics, exercise range, easy of use, construction, user safety, and heart rate monitor. So what class does the GX8 belong to? 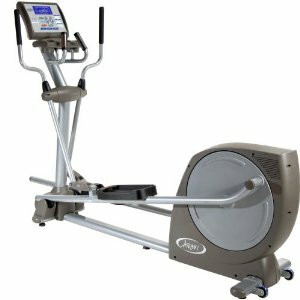 This trainer has an MSRP of $2795 but sells at the official Stamina Fitness website and at Amazon.com for $1299. If you can get over the ugly console, the rest of the Stamina Avari GX8 elliptical is a sure bet, and a great value at $1299.